Did that Bucs-Browns game set football back 20 years? Nah. But the Sage of Tampa Bay sports has plenty to say in the aftermath of a wild Bucs victory. 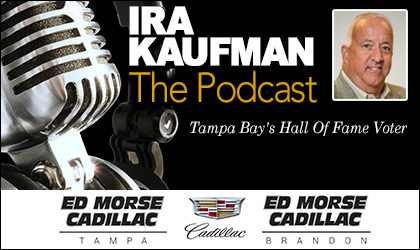 It’s always a fun and informative time on the Ira Kaufman Podcast presented by Ed Morse Cadillac Tampa and Ed Morse Cadillac Brandon. Click play above or tune in at iTunes, Google Play or Podbean.com. And you can find it on the Google Play podcast “Top Charts,” ALL genres. Stay informed, thinking and smiling every single Tuesday & Thursday — and there is NO offseason. Listening to “The Sage” is fun, free and easy. Enjoy! Lee, please don’t ever do that “I warned you” voice again. Its stuck in my head, and not in a good way. That being said, I always love your takes on the bucs, even if I disagree with your Winston takes. Keep up the good work! Who woulda thunk it? Oh just the haters that have been screaming from the rooftops for years. And to think we could have drafted Donald, Garrett, Rankins or Short all of which are NOT made of suga and spice and everything nice. The goal line stand was the play of the game imo. Come on Joe…you know why Koettter went for that 40 yard FG, don’t you? He saw Jameis’s play in overtime…and he didn’t want him to throw the ball in tight coverage, resulting in a turnover or a pick six. After all, what other reason can you speculate, unless you chalk it up to stupidity or insanity. And I don’t. Yes Joe…that call speaks more to Koetters faith in Jameis to not take a sack or throw and interception or something of the sort, than anything else. Just consider what it says about what his opinion of Jameis’s play at that point in time. Then why not run the ball in OT. They need 10 yards tops? Why not run it? God bet on the Bucs last Sunday,……that’s why you got the 59 yrd’r. When it comes to 93 that’s not a minority of fans. DB55…with our running game? And even then, the chance of a fumble, poor exchange, etc.. Frankly, I don’t think he had much faith in either in that situation. Is it that McCoy free-styles too much and goes for personal stats? I.e. instead of maintaining gap integrity he’s trying to get sacks or get the solo tackle or something? Seems we are better at defending short yardage with him out. Great podcast Lee and Ira love calling out Coach K for not attempting to advance the ball with the timeouts and the clock that was high school football 101 all I can say is this coaching staff Has to look at The strength‘s and weaknesses and maximize the strengths clearly Winston is a very good thrower on the run maybe Dirk goes a little bit against his grain and adds some read option plays maybe Dirk at some point develops roll out plays perhaps you put in misdirection screens instead of those diagrammed bubble screens.